Refer to my downloads page to get these critical applications! ►Microsoft shocker! Windows Live OneCare takes last place! ►Do you have a Hewlett Packard peripheral that stopped working? ►Now we know why your cursor freezes up sometimes! When was the last time you had your computer cleaned? Ad-Aware 2007 is now available! Click the picture to download the latest version now! 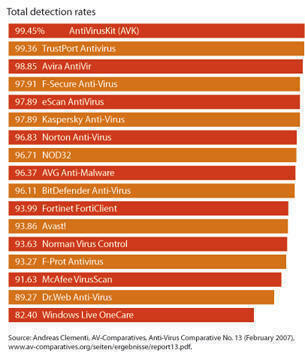 Windows Defender Microsoft shocker! Windows Live OneCare takes last place! The testing firm AV-Comparatives.org has released test results for 17 products, based on the products' success with almost half a million sample files. Alone among the products tested, Microsoft's Windows Live OneCare did not qualify for certification; in fact, it did not even reach the levels required for participation in future tests. You read that last part correctly! Microsoft's product scored so poorly, that it will not even be included in next year's test! AS Consulting continues to recommend Norton Internet Security 2007. Is your computer getting slower? Is it just acting weird? Do you have a Hewlett Packard peripheral that stopped working? http://h10025.www1.hp.com/ewfrf/wc/genericDocumentdocname=c00802504&cc=us&dlc=en&lc=en&jumpid=reg_R1002_USEN Is your existing system showing its age? Don't forget, I build my own systems with the highest quality parts available. If something does go wrong, you won't be speaking to someone in a foreign country, you'll be speaking directly to me! Ad-Aware 2007 Free remains the most popular anti-spyware product for computer users around the world, with nearly one million downloads every week. Our free anti-spyware version provides you with advanced protection against spyware that secretly attaches and takes control of your computer, resulting in aggressive advertising pop-ups, sluggish computer activity, even identity theft through stolen bank details, passwords, and credit card account numbers. If you want real-time scanning capabilities, consider upgrading to Ad-Aware 2007 Plus for real-time protection against spyware, all the time! If you have a wireless router, remember to enable security! WEP is good, but WPA is way better. Feel free to call for assistance. This has nothing to do with computers, but I think it is pretty funny! These days, a good backup is a must! Now we know why your cursor freezes up sometimes! Once you see this website, you'll never get upset with your cursor when it behaves erratically. Click on the link below, and be sure to move your mouse around and click occasionally. Don't forget to pause every once in a while too. Those cursors get tired! All ASC computer systems are now shipping with a coupon for a free upgrade to Windows Vista! If you were holding off getting that new system for the holidays, there is no longer a need to wait! Feel free to call for a free quote on an ASC computer system. If you would rather not be on my newsletter list- no problem! Send me a quick email and I'll forever take you off. If you know someone who would like to be placed on my mailing list, have them drop me a line as well.